Valentina Harris, author of The Food and Cooking of Venice and the North-East of Italy, has long been the UK’s Italian culinary authority of choice. She has oft graced our TV screens in her own popular series as well as guesting on many food programmes. You might have had a glimpse of her working with the Supersizers, Sue Perkins and Giles Coran. That particular episode concerned the food of ancient Rome – not surprising as Valentina attended the Cordon Bleu in that very city, although not that many years ago. The region around Venice does indeed offer Italian food, but its dishes is unlike those you will find in the more celebrated south. There the Pizza is king, and pasta is a religion, with fresh red tomatoes as the altar boys in attendance. 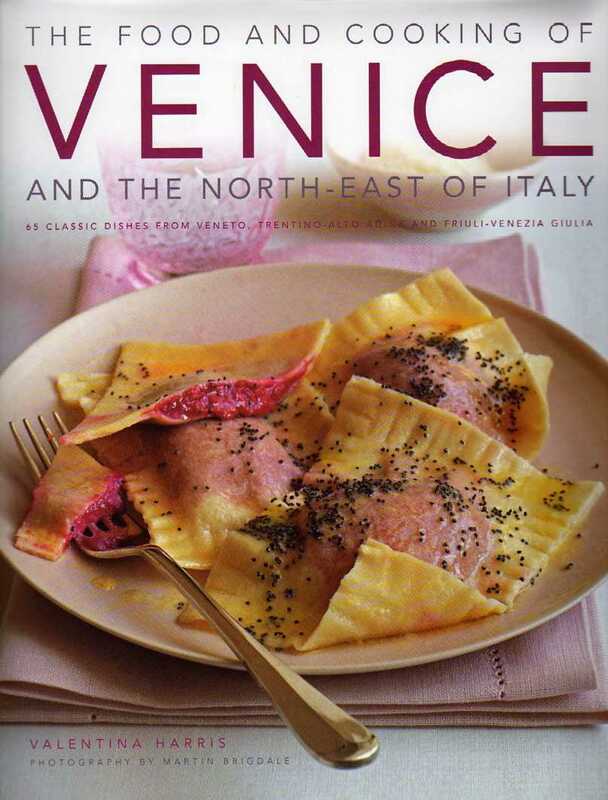 The Food and Cooking of Venice introduces the reader to the less Mediterranean-influenced dishes of the north. Venice is, after all, closer to Basle than to Brindisi. This book comprehensively considers everything from soups to desserts, from rice to cheese. There is a chapter on regional history and another on local festivals, to put the food into context. Valentina gives an overview of classic ingredients which are all available in regular supermarkets. There are some hearty soups here that will be welcomed by those coming home frozen from snowy streets of cities even further north than Venice. Trentino Barley Soup – Minestra d’Orzo alla Trentina – is a thick soup of vegetables, potatoes and barley flavoured with ham. Some rustic bread and a glass of red would constitute a fine meal on a winter’s night. Polenta Conzata – dressed polenta – is the archetypal Italian comfort food. The texture makes this a moreish dish although it must be said that polenta is bland. It’s a vehicle for robust flavours which, in this case, is Asiago cheese with some ricotta to add richness. This is a soft polenta rather than the more solid variety which can be sliced and grilled. The most technically challenging recipe here is that for Anatra col Pien – Venetian stuffed duck. The method and cooking are simple but it does demand a boned duck. Ask your butcher (go to a real butcher rather than a supermarket) or have a go yourself. It is not as hard to do as you might imagine and it’s a handy skill to master. The boned and stuffed duck makes for a stunning presentation. This would make a change from turkey at Christmas and will feed six. The desserts here are a collection that will tempt you away from righteous dietdom. Frittelle Veneziane – Venetian fritters – are light battered delights filled with sultanas, pine nuts and mixed peel. Eat these while still hot, dusted with a little icing sugar. Sit by your log fire (ok, use your imagination), sip a glass of chilled dessert wine and munch on a few of these. Delicious. Valentina Harris continues to educate us on the virtues of Italian food. Both her style of writing and her recipes are accessible and you will likely want more of both. I am continually charmed by her books which are some of the best around on the subject. Her passion and enthusiasm are evident and this marvellous book is another fine vehicle for them. A great gift for any lover of Italy and its food. I look forward to more of Valentina’s culinary excursions.